The San Rafael Student Home is located in a safe residential area in San Rafael (San Francisco - North Bay). The ELS Language Center San Rafael, shopping centers, restaurants and banks are nearby. Students can get around easily on our free shuttle bus, on foot, by bicycle, or by bus from the nearby bus stop. See our visitor information for maps and information on local shopping centers, supermarkets, sightseeing, entertainment and restaurants. Contact ELS – ELS North-Bay has an airport pick-up service for their students. From the San Francisco airport (SFO): take the “Marin Airporter” bus (outside the arrival hall) to the San Rafael Transit Center. The bus leaves every 30 minutes and takes about 1 hour and 15 minutes. It costs about $20. 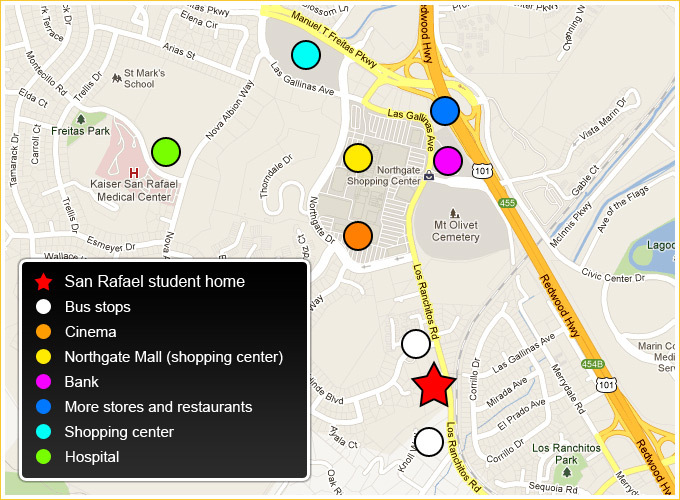 From the bus stop in San Rafael, take a taxi to the Student Home at 179 Los Ranchitos Road (about $10). Only 3.5 km from the Student Home, the ELS San Francisco North-Bay Language Center is located on the beautiful campus of Dominican University (DUC). Our free shuttle bus takes students to class in the mornings (it's usually only a 5 minute trip), and then picks them up after school and in the evening. In addition, a public bus operates throughout the day between the bus stop near the Student Home and Dominican University. You can also ride a bicycle there in about 20 minutes. College of Marin is one of California's finest two-year community colleges with a campus in nearby Kentfield and Indian Valley. College of Marin has many facilities available for students. College of Marin can be reached by bus. The Kentfield Campus is about 5 miles (8.5 km) from the Student Home, while the Indian Valley Campus is about 10 miles (15 km) from the Student Home. Want to know how to get somewhere? Use our search tool to get directions from the Student Home. You don't need to enter commas or a zip code. See some of the example searches below. Here are some example searches. COPY AND PASTE any of these addresses into the search box above. Remember that for less well known places you will probably need to enter a street address. We're sorry, your screen is too small to show the Google map and directions. Please try again on, for example, a tablet or desktop computer.